To meet the varied requirements of patrons, we are engaged in manufacturing, supplying and exporting Electronic Hooter. 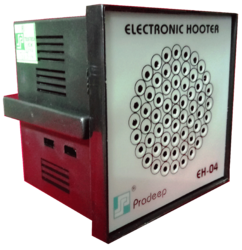 We manufacture these electric hooters by making use of the quality assured raw material, sourced from the authentic vendors so as to ensure their durability. Post production, we check these electric hooters to ensure their less power consumption and optimum performance. Provided electric hooters are used for control panel & desk and other alarm annunciation boards. Keeping in mind the requirements of patrons, we have come up with Industrial Electronic Hooter. Made at our sound manufacturing unit using modern machinery and best grade raw material, offered electronic hooters ensure to serve patrons for long. Furthermore, we make these electronic hooters pass a quality check prior to dispatch so as to ensure their flawlessness.